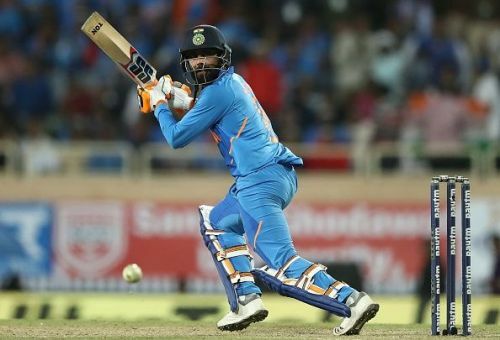 The five-match ODI series against Australia was India's last international assignment before the ICC World Cup 2019. The mega event is scheduled to begin on 30th May and the squads for the tournament should come out in a month's time. This means that while players will get a chance to showcase their abilities in the Indian Premier League, there are no more games for the selectors to try players in the 50-over format. Hence, we are at this place, where every player has had their last audition to board the flight to England. While the final decisions are yet to be made, one would assume that Virat Kohli, Ravi Shastri, and MSK Prasad have a rough idea of what their squad will be. However, there are a few players whose selections will go down to the wire. One of those players is Ravindra Jadeja. The Saurashtra all-rounder has been in and out of the limited-overs team for almost a decade now. From 2013 to 2017, he was a consistent member of the team and a regular presence at number seven. India's loss in the Champions trophy final along with the arrival of Hardik Pandya and emergence of Kuldeep Yadav and Yuzvendra Chahal changed everything. It looked like Jadeja and Ravichandran Ashwin's limited overs aspirations were over. However, an injury to Hardik Pandya during the Asia Cup earned him a recall into the ODI team. India's search for an alternative number seven made them go back to Jadeja. With Pandya's suspension and constant injuries, the 30-year-old has got a lot of opportunities over the last six months. At the moment, it looks like he will make the 15-man squad. Is Jadeja the ideal number 7? However, India needs to be careful about this decision. While he makes for a great squad member, you are bound to question where does he fit in the starting line up. For the majority of his career, India has fielded him as their number seven. However, Jadeja has hardly proven his worth as a batsman in that position. His career ODI strike rate is 84.23 which is clearly not good enough for a position that requires a player to get the team quick runs towards the end of an innings. Since his comeback in last year, his strike has dropped to 70.34 in the 15 matches he has played. While he has shown in the Asia Cup games against Afghanistan and Bangladesh or the second ODI vs Australia, that he can hang around if required but he has failed to deliver when the team needs him to score at a fast rate. Quite clearly, he is not an ideal batsman for that role. His presence does not provide the same strength and depth to the batting unit that Hardik Pandya will. Can Jadeja play as a proper bowler? Another temptation that arises is to feature Jadeja as one of the two regular spinners in the side. Without a doubt, this gives India variation in the attack as his left-arm spin will perfectly complement a wrist-spinner. He offers a very economical option to Virat Kohli. His career economy rate is a very impressive 4.88. Since his comeback, he has maintained a similar rate of 4.75. However, his average is not really that impressive. His career average in ODI cricket is 35.89. Also, he maintains similar figures since the Asia Cup with an average of 36 having picked up only 19 wickets in 15 matches. The 2017 Champions Trophy showed on flat tracks with no assistance for spinners, Jadeja becomes completely ineffective. Should Jadeja go to the World Cup? The question that arises is whether Jadeja should board the flight to the United Kingdom in May. While he is not the best candidate for any place in the team, with the lack of time left, we are likely to see him earn a place. While his presence in the first choice starting XI is something India have to avoid, but as an option to have on the bench, he is a utility member to have. In case of injuries, he can cover up as the genuine all-rounder and even the main spinner. Although India need a better player than him at both positions, he can do a job for the team there. Moreover, he is arguably one of the best fielders in world cricket and as a substitute, he can add real value to the team. Ultimately, his experience is likely to tempt the selectors to give him the ticket. It's up to the captain and coach to see his limitations and use him only in extreme circumstances or when a player needs rest.